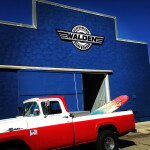 Wholesaler and retailer of surfboards, specializing in long boards. Also, surfboard rentals/demos. $35.00 for the full day. We offer a full size range of boards, all demo/rental board sizes. Store Hours: Tues.-Sat. 9:30-5:30 Sunday 10-4 Monday-closed.